I don't think one could ever exhaust the opportunities for night photography in Santa Fe, what a gorgeous city at night! 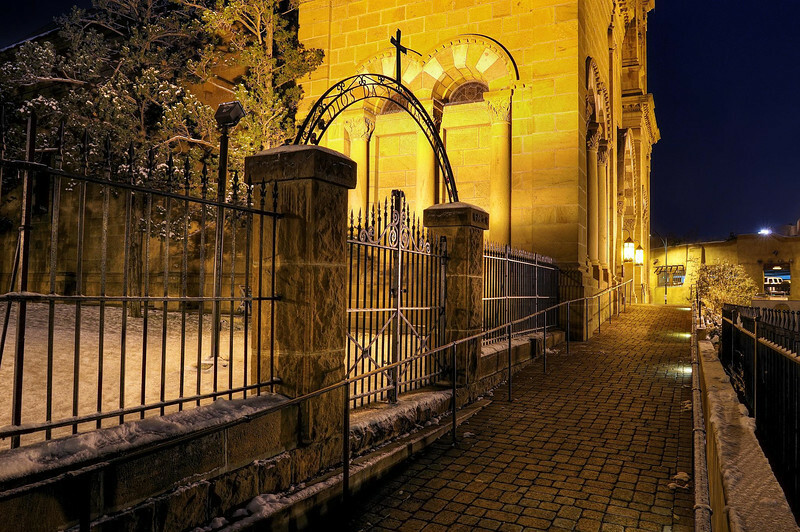 Here a pathway outside of St. Francis Cathedral is featured. Image notes: this image is a blend of an HDR (3 frames 1EV apart) and the middle exposure. I find with HDR I often prefer to finish my HDR image the very best I can and then to take a copy of that and blend it on a non-hdr middle exposure frame for a slightly more subtle result. For the non-hdr version, see the cropped version below in the comments.